On 1-28-70, the undersigned re-interviewed Danny DeCarlo, who has been mentioned in previous reports. 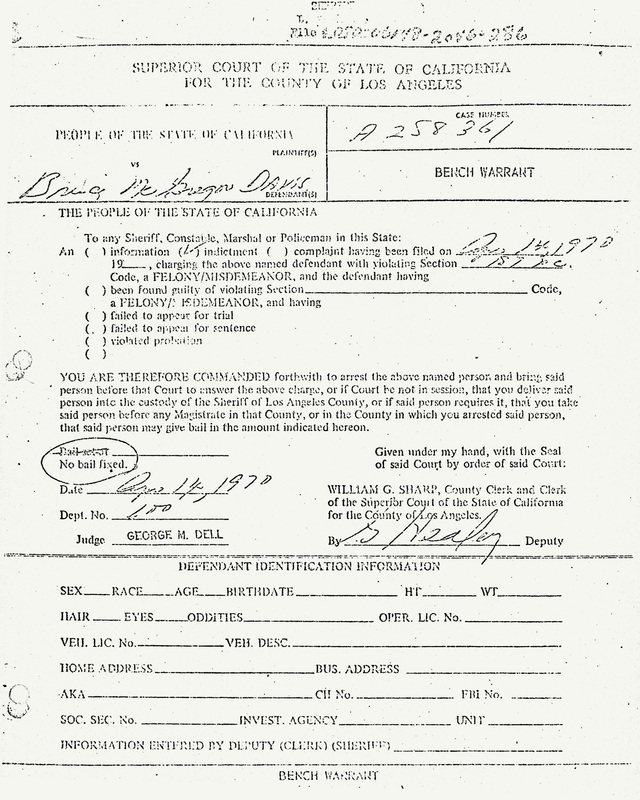 Mr. DeCarlo stated in July, 1969, he, Charles Manson, and Bruce Davis went to a gunshop in Canoga Park, where Bruce Davis purchased a 9mm Radon Automatic pistol. Further, that a week prior to the Hinman murder, in the late part of July, Charles Manson stated to DeCarlo, "We're going to Gary's house and get $10,000 one way or another." Approximately one week later, Robert Beausoleil admitted killing Gary Hinman as in a previous supplementary report. Mr. DeCarlo further stated at approximately this time, Charles Manson gave a 9mm Radon to a young boy from San Bernardino named Larry. In the first part of August, upon hearing of Robert Beausoleil's arrest in the Hinman vehicle with the knife in the trunk, Charles Manson stated to Mr. DeCarlo, "I told him (Beausoleil) to get rid of the car and wipe it down for prints and to get rid of that knife." Mr. DeCarlo added that it was at that time of this statement that Charles Manson had a deep cut on his left index finger. On 3-12-70, Deputy Gleason interviewed Randy Star of Canoga Park, part-time cowboy stunt man for motion pictures. Mr. Star is familiar with the Manson family and frequents Spahn Ranch. Mr. Star stated in June 1969, he gave a hunting knife to Charles Manson with Mexican writing on the blade and a bird on the handle. On 8-6-69, a knife of similar description was recovered in the Hinman Fiat Station wagon being driven by Robert Beausoleil in San Luis Obispo. On 3-6-70, undersigned interviewed Michael Dennis Hendricks, MC/17, presently in custody Ventura County Jail, who stated that approximately one week prior to his arrest in Crestline, California (8-9-69), he observed Sadie (Susan Atkins) driving a 1965 white station wagon with the radiator sticking out the front, around the area of the Spahn Ranch. Hendricks further stated at this time, Charles Manson gave him a 9mm Radon automatic without pistol grips and told him, "Do me a favor and kill a cop." On 3-11-70, Deputy Gleason proceeded to Crestline Park, California and recovered a 9mm Radon, Serial No. L 6365 without pistol grips under two inches of pine needles. Deputy Gleason was directed to the location by Officers Norma Braubaker and Allen Penton, San Bernardino Sheriff's Officers, who were also the arresting officers of Hendricks. The weapon was loaded with one live wound in the chamber and five in the clip. Deputy Gleason transported the weapon to the Sheriff's Crime Lab, Receipt #144500 was issued and the weapon was test fired for comparison with a 9mm expanded bullet recovered from under the sink at the Hinman residence. Deputy Christian, Ballistics Station, stated the comparison was probable that the weapon had the same amount of lands and grooves and come of the same individual characteristics. On 2-11-70, Federal Agent Michael Warner, Alcohol, Tax, and Firearms, interviewed Mat Stanoff, DBA Surplus Distributors, **** Boulevard, Van Nuys. 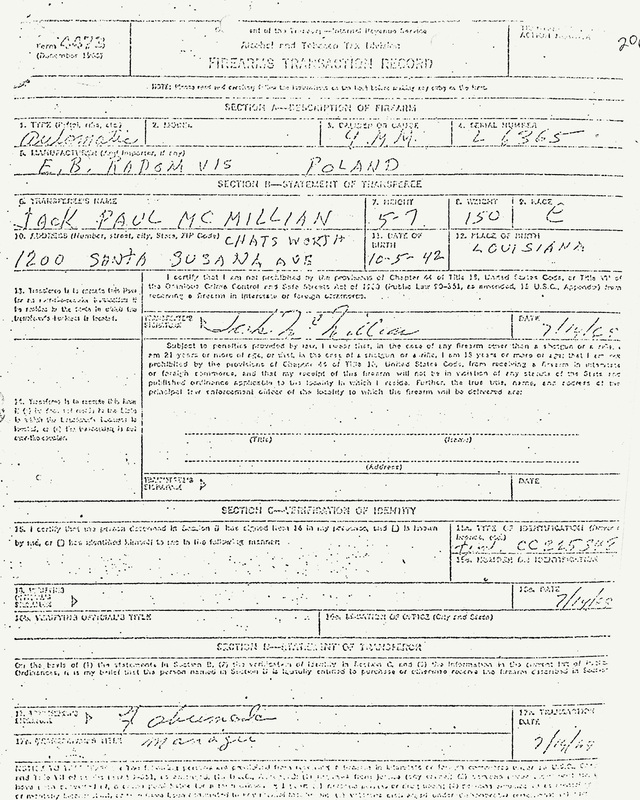 Mr. Stanoff stated on 7-14-69, he sold a 9mm Radon Automatic pistol, Serial #6365 to Jack McMillan. Agent Warner showed Mr. Stanoff a group of mugs and Mr. Stanoff identified Bruce Davis and Charles Manson. A warrant was issued in Federal Court for the arrest of Bruce McGregor Davis, who is presently in Los Angeles County Jail, charge of Purchasing a Firearm under a Fictitious Name. A copy of the firearm transaction and Federal Warrant to be made part of this report. On 3-12-70, Mark Arneson, ****, Hawthorne, was arrested by LAPD, Officer ****, #11951, Venice Division, at 83rd Street and Fordham in Los Angeles, pursuant to Division 64 Warrant #A 059953 charging A96 PC. Arneson was subsequently transferred to West Hollywood Station and interviewed by Deputy Charles Guenther. Arneson stated he went to the Spahn Ranch in July or August, 1969 and had a conversation with Charles Manson in the accompaniment of Robert Beausoleil in the salon building. He stated Manson asked him if he would like to have a car and he replied "Yes." Manson and Beausoleil and himself got into a 1965 white station wagon with the engine sticking out the front (Beausoleil driving) and went to the rear of Spahn Ranch where a 1956 Volkswagon Micro-bus, red and white in color, with a large eagle painted on the sides, which was parked among the trees. Arneson stated a few weeks later, he sold the vehicle to Louis Pubeck. The vehicle was subsequently recovered and the registered and legal owner is Gary Hinman. On 3-13-70, undersigned interviewed Deputy Grap, Malibu Station, who stated on 7-28-69, he responded to the Spahn Ranch and observed a 1965 Fiat station wagon, white in color, parked in front of the ranch buildings. This vehicle was run through Department of Motor Vehicles and the registered owner was Gary Hinman. He further stated at this time, he made field investigation reports on Charles Manson and Robert Beausoleil who was present.